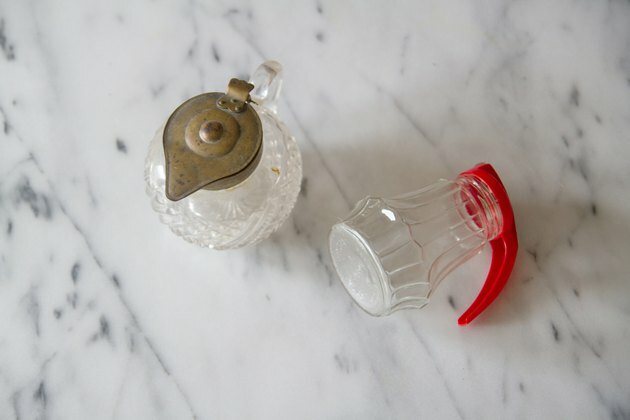 Antique glassware, vases and bottles may be yellowed or cloudy for any number of reasons, such as mineral deposits and residue left behind from liquids once inside them. 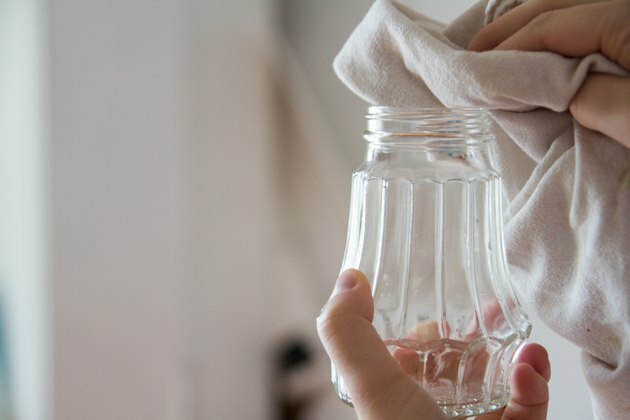 Instead of resorting to harsh chemicals, clean your favorite finds with natural glass-cleaning solutions such as vinegar or baking soda. Sometimes a simple soak in soapy water removes those age-old residues that make the glass look cloudy or stained. Rinse the affected glass item off, or rinse it out if it is a vessel of some sort, such as a vase or bottle. Rinsing first helps remove the loosest debris and helps keep the water in the sink or plastic tub cleaner. Place a rubber mat or folded tea towel in the bottom of the sink or plastic tub to protect delicate or valuable antique glass. Then fill the sink with enough warm water to submerge the affected glass item, adding a generous squirt of dish soap. Do not soak an item that is not meant to be submerged, such as a goblet with a wooden handle, or an antique bottle with a paper label. 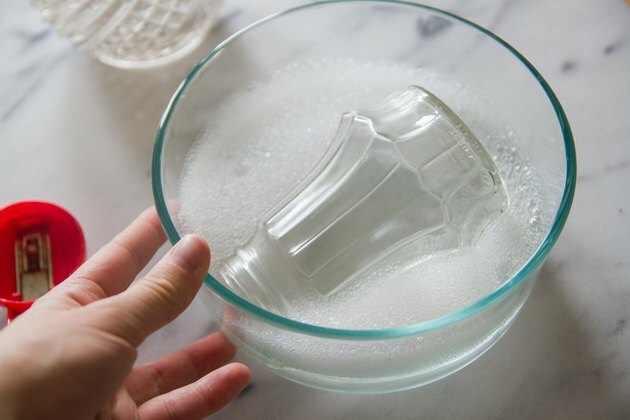 Instead, put the soapy water inside the glass. Allow the item to soak for 20 or 30 minutes, and then wipe it down with a soft dishcloth. Use a soft-bristled bottle brush to reach inside a durable bottle or vase. Shake a bottle that is half full of soapy water by putting your hand over the opening; sometimes the shaking helps remove some of the debris. Rinse the item out several times, and allow it to dry completely. Vinegar helps remove mineral deposits left behind by evaporating water and other liquids. 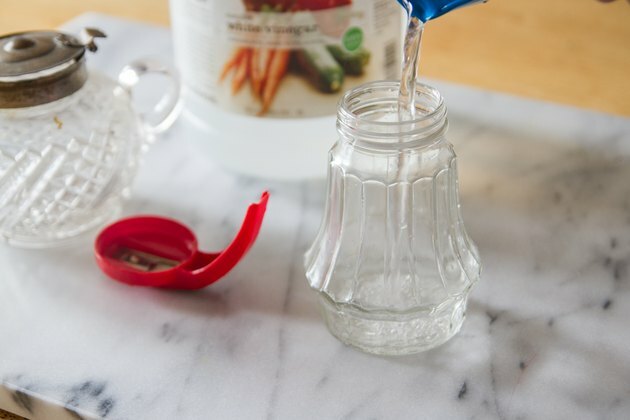 Fill the glass item with equal parts white vinegar and water, using enough liquid to cover the cloudy area. Allow the liquid to sit for a day, and then clean the glass with a nylon scrub pad. If the item is too narrow to reach into, place a handful of uncooked rice in the bottle, swirling it around with the vinegar. Swirl the bottle every few hours or as you remember to do it. Strain out the rice, dump the vinegar down the drain and discard the rice in the trash. If some of the mineral deposits remain, fill the glass again, this time using undiluted white vinegar. Rubbing alcohol comes to the rescue for filmy residues that cloud or yellow antique glass. Pour some rubbing alcohol onto a soft white cloth, and then wipe down all the areas you can reach with ease. If the film is inside a narrow vase or bottle, pour less than an inch of alcohol into the bottle and swirl it around to remove the film. If the film doesn't disappear without help, drop in some uncooked rice or dried lentils to use as an abrasive. 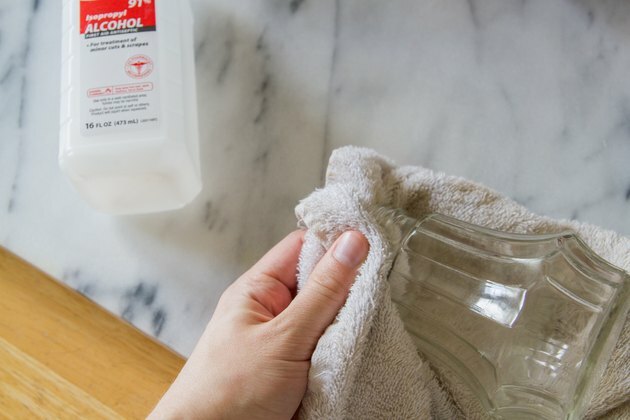 If the glass item isn't completely clean after you try other methods, clean it again with a nontoxic, citrus-based solvent such as an adhesive remover or paint stripper. Use only nontoxic cleaners to avoid breathing in harmful fumes; most citrus solutions are nontoxic. Pour a little of the solution inside a narrow glass vessel, or dab some onto a soft white cloth, wiping down areas that are easy to reach. With a citrus paint stripper, leave the solution in or on the glass for a short time at first, such as half an hour. If the short soak doesn't work, leave it on for a longer amount of time, or as recommended on the package label. Rinse the glass, and then wash it thoroughly with mild soap and water to remove the citrus liquid.